These are specially selected enzymes and supportive ingredients to help you breakdown your food and enhance absorption of key nutrients that we need from our diet. It is recommended for those with digestive challenges, who take antacids or reflux medication regularly and for older clients who need some extra help as we age. As always, no fillers or wasted space in the capsule – we have maximized the contents and value for you! Digestive enzymes can be used daily as an assist. As we age or after years of using anti-acid strategies, our digestion can become less than optimal. A general digestive enzyme gives us a boost to breakdown food better and therefore absorb more of the nutrients as well as experience fewer effects (bloating, gas, cramping, etc.). Specific digestive enzymes are used to target specific chemistry – fats, proteins and carbohydrates need different pathways of digestion. Dairy, grains, meats and gluten are targeted with specific enzymes to help digest. 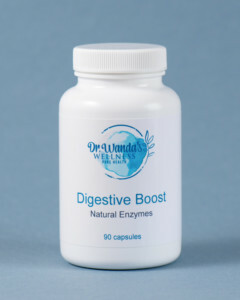 Read more about Dr. Wanda’s Digestive Boost by clicking here. Check out some of the research supporting these supplements in our Research Library!